I've not had much time for miniatures except pottery. It works for me that I have a set time away from home, where I can concentrate on pottery only! There are several new pots that might be good enough for a mould, and there are some more blue and white ones about to go in the kiln. Unfortunately I keep forgetting to take photos. Except for these two! The bigger one is huge as 12th scale goes, about 2 inch high. They will shrink about 10-15% in the first firing. And these in red and orange, they have been fired, but didn't come out as expected. A bit blotchy and thin in places so they will be refired with another layer of the glaze. 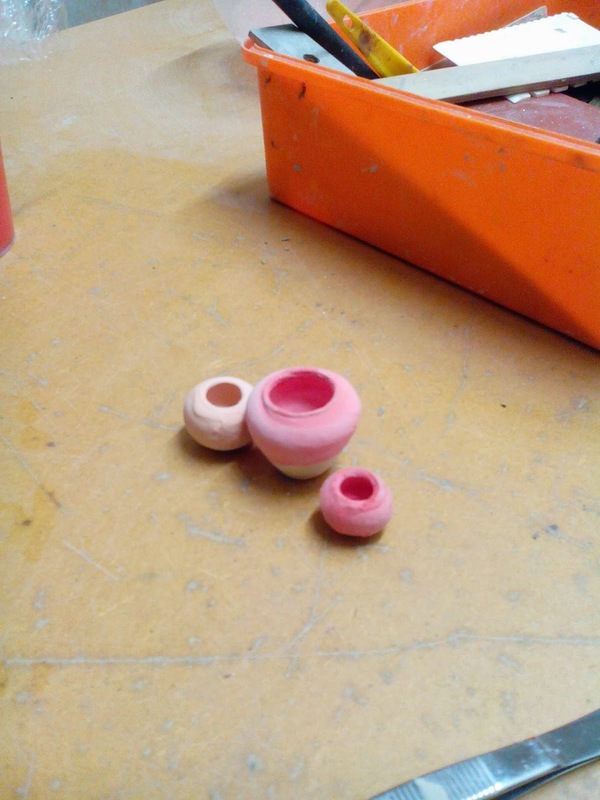 The lighter one will be very different when fired and the pink ones will be a warm red! I think that one of the most difficult parts of making tiny pottery is the glazing, it rarely turns out as expected. Still, I'm quite pleased with these! Oh and I promise to take more photos! The are coming along beautifully. You are very talented at pottery. The pottery is so lovely. I would like to see the pink ones turn red after firing. More photos please :-) Beautiful work, Idske! Hi Idske! Een vriend van mij is ook pottenbakker en ik heb van hem begrepen dat de procedure van pottenbakken nog niet zo gemakkelijk is, als het allemaal lijkt. Met die glazuur is het inderdaad altijd een verrassing, maar het akn natuurlijk ook mooi uitpakken :D! Ik vind de eerste potten, ondanks dat ze wat groot zijn, erg mooi gemaakt.